Need to perform a repair installation of SQL Server 2012 and can’t locate your original CD key? How can I recover lost product key from SQL Server 2012 installation? If you’ve misplaced your SQL Server installation key, you can retrieve it from Windows registry using a key finder program. 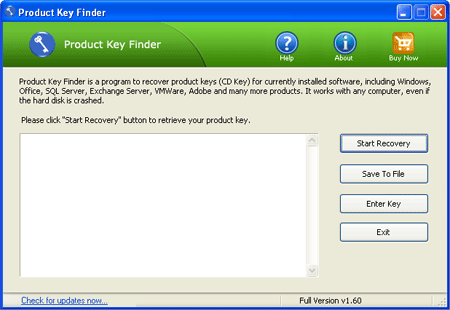 Product Key Finder is a simple program that can help you find lost product key of SQL Server 2012/2008/2005/2000 from Windows registry. Since SQL Server 2012, Microsoft has changed its algorithm to encode the product key. This cause most of key finder program become useless. Product Key Finder is the unique program available on the internet that can decrypt SQL Server 2012 product key flawlessly. How to Find SQL Server 2012 Product Key from Windows Registry? Start the Product Key Finder program. Select the From current system mode from the drop-down menu. This program will automatically scan your Windows registry, quickly find and recover your lost SQL Server 2012 product key, along with license keys of Windows, Office and other programs. Now click on the “Save To File” button. It allows you to export the product keys into a text file.